Finally, a poll in Hawaii. Better late than never. Kerry's ahead there. No surprise. C'mon Wyoming, if little Hawaii can do a poll, you can, too. We're counting on you. Rasmussen released three tracking polls, all taken daily from July 1 to July 31. Kerry is ahead in all of them. In Ohio by 46% to 45%, in Washington by 50% to 44% and in Maine by 48% to 44%. For Ohio and Washington we have August polls, so we will not use the Rasmussen polls there. For Maine, the most recent poll is Rasmussen's tracking poll for June, so we will replace it by the new one. 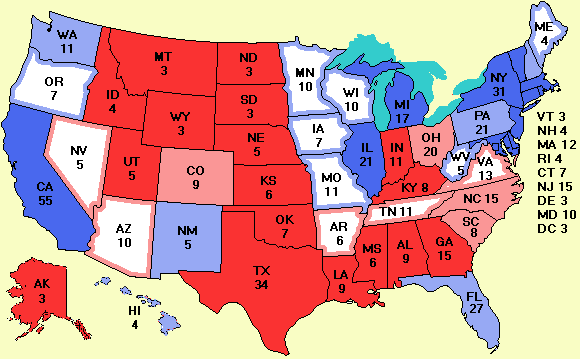 The result in Maine is essentially the same, a slight lead for Kerry. Since Maine awards its votes in the electoral college by congressional district, it would have been nice if there were a breakdown by CD, but there isn't. Probably because Rasmussen uses fully automated computerized polling. Of course the computer could have been programmed to say "If you are in congressional district 1, press 1; if you are in congressional district 2, press 2; if you don't have a clue what a congressional district is, press 9." But the smart money would be betting on 9. Someone made the comment to me that the reason the AOL mock election cited yesterday was so skewed towards Bush is that AOL started out offering dial-up service on modems. As people switch to broadband, probably many of them drop AOL since most of the broadband companies offer Internet access themselves so why pay AOL an extra $15/month for its service when you already have Internet access? A consequence of this reasoning is that the AOL customer base might be overweighted in areas where broadband is not available, that is, rural areas, and Bush is popular down on the farm. Might be true. Another site where you can play Karl Rove or Mary Beth Cahill is run by the League of Women Voters. If you want to know what these folks look like in case you run across one of them on the street and have a message to deliver, here are their pictures. Mary Beth is the official Kerry campaign manager. The official Bush campaign manager is Ken Mehlman, but no one doubts for a second that the real brains behind Bush/Cheney '04 belong to Karl, who is a actually a government employee working in the White House with a title like Senior Advisor to the President. He is a political genius and people underestimate him at their peril. We passed another milestone yesterday. For the first time, there were over 50,000 visitors to the site. Keep spreading the word.